You are here: Home › The Learning Curve › That Bungee Thing! Every once in a while you experience something that shifts your perspective, and your world becomes more colourful, more vibrant, higher-definition. Suddenly the preconceptions you had are shattered like pieces of Lego, and you have a glorious opportunity to reconstruct them from scratch, with newfound wisdom. Emotionally, it could be the result of meaningful conversation, or a powerful film, or a traumatic event. But physically, it could happen as a result of an injury or illness, a breakthrough in mastering a skill, or a discovery of a new physical feeling or experience. As we travel, Myles and I are not collectors of objects and souvenirs; we are collectors of these experiences. We love finding new/inspiring/challenging things to see and do. 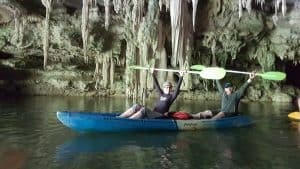 SCUBA diving, paragliding, indoor skydiving, aerial silks, trapeeze, motorcycle racing, and cave kayaking are such activities that widen our horizons physically and mentally. I am so often in the role of teacher that physical epiphanies are something I am used to causing for students, but not something I usually get to experience for myself. It’s a healthy thing to be humbled by a new experience, and as a teacher to put yourself in the position of your students to develop empathy for the vulnerable learning experience. Two months before our planned vacation in Thailand, the Facebook gods delivered a message through my news feed. It was a promo video for a new fitness trend called Bungee Workout. I watched, fascinated, as the narrated dancers bounced around in harnesses attached to bungee cords suspended from the ceiling. My heart raced as I felt immediately drawn to the bungee cords – such a familiar tool for us as West Coast Swing dancers, but being used in a totally foreign and playful way. I *needed* to try this experience. When the promo mentioned that this rare studio offering it happened to be in Bangkok, there was no question this would be #1 on on our must-do list. We were 2 of 6 people in the class, in a clean, white, modern studio with floor-to-ceiling windows on the 9th floor of an office building. The instructor, about 5 feet tall with relatively good English, introduced herself as PK, a hip-hop teacher who had recently been trained in this new style of dance fitness. She led us through a typical jazz warmup and stretch, then assisted us into the specialized harnesses, which seemed almost like rock climbing harnesses with a bit more padding. We took our places on the floor and had to jump up to be hooked in to our individual bungees suspended from the ceiling. This created tension on our harness even just standing. I was dying to play and bounce around to try it, but I wanted to be respectful and follow the instructions. PK did a great job orienting us to the equipment, explaining the vocabulary and coaching us with movement techniques. Teaching one 32-count “phrase” at a time (without music), which built a skill progression. Each 8 count got slightly harder, and each phrase slightly harder. After explaining, demonstrating, and having the whole class try it together, she gave each of us personal feedback to make sure everyone got it. At the halfway point and at the end, we tried the sequence to music, which we had filmed. Over the course of the 90-minute class, my senses were on hyperdrive as I giddily explored the foreign sensations. Like toddlers exploring their environment discover the properties of the objects around them through a series of tests – taste test, chew test, banging test, etc., I felt like a toddler trying to explore the properties of this new toy. I dropped, leaned, ran, jumped, swung, and even tried “the slash”. Myles and I played with partnering, but failed because both of our bungees pulled us away from each other. Which makes sense, since in WCS our arms become the elastic, rather than an external elastic pulling us from behind. Having interaction restricted made us even more motivated to explore what movements were available. For example, the harness attachment made it impossible to face upward to the ceiling, or even sideways, but we are only experts in upright dances, not face-down dance! I was humbled by this foreign mechanic: I’ve been in harnesses before for rockclimbing and trapeze, but these were only intended to be for occasional use: the quick rappel down a wall is nothing compared to the “workout” our groins got from an hour of grinding our body weight into the lightly padded straps. It felt counterintuitive to not stand up: to drop my weight into the harness on purpose and allow the bungee to take my weight. PK kept encouraging the class to “engage your core” in order to force the bungee to let you lower down. I doubted this advice because I was doing a lot more than simply engaging my core in order to squat – it was necessary to lighten the load in my feet in order to transfer more of it to the harness. I also noticed this was a bit more difficult for me than the others because my bungee had been set too high at the beginning of the class – something I would have corrected for next time. But I wonder if a less experienced participant would have correctly attributed this challenge to faulty equipment or if they would have assumed responsibility and attributed their difficulties to their own aptitude. This is something as teachers we need to consider when new dancers are exposed to their first group class/event/competition: what conclusions might they draw about their own skills if dealt a set of non-ideal circumstances? How can we prepare them to be flexible, adaptable, and know when “failures” are not something to take personally? Speaking of failure, I found myself conflicted: I wanted to do my best and follow the instructions accurately, but at the same time, I was curious about what would happen if I didn’t. For example, PK said, “Don’t stand upright when you jump – pitch forward”, which makes sense to me cognitively and is practical advice for WCS too, but I was super curious how the bungee action would be affected if I intentionally jumped with incorrect pitch. I wanted to fail on purpose – to do it wrong to see what the outcome would be. I felt like if I knew what outcome I was trying to avoid, I would better understand how and why to follow the best practice. As teachers, we owe it to our students to explain the how and why – this is how they develop literacy. Students benefit from exploratory, experiential learning: they need time to feel what movements feel like when they are wrong or off target, in order to use that feedback to adjust their aim. I recognized the transition as I became desensitized and was able to manage all the new stimuli. 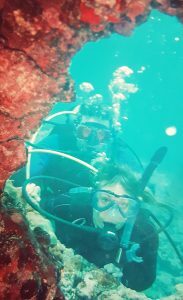 (It was the same process when I learned to SCUBA dive – there was just so much for your brain and body to manage – who knew that simple breathing would be such a daunting task?) 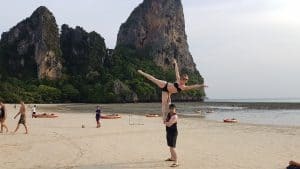 Once my body learned to juggle and accommodate all the foreign sensations, my brain was able to focus on other tasks, such as dance refinements, being musical, and “pushing harder”. I also was able to turn my attention to the other participants to see if they were experiencing the class the same way I was. To my surprise, they were also first-timers, but struggling more with the mechanics. As a teacher and coach trainer I am constantly shopping for new teaching ideas and am always fascinated to compare and contrast physical skill development methods. As I expected, the concepts of skill progression span language, culture, and dance style. Here they were applied appropriately, even though they were not well explained. I thought it might be just the instructor’s English skills that were limiting her explanations, but more likely that her training was not that comprehensive. It didn’t bother us – as experienced dancers we could fill in the blanks. But the less experienced participants struggled as a result. Some were successful at manipulating the bungee as needed, but some couldn’t manage the resistance. Since the whole game is about managing, manipulating, and playing with the resistance, I wonder how much fun they ultimately had during the 90 minute session. I wonder if their limited success was enough to inspire them to come back for more. How much are WCS teachers self-sabotaging their classes by making dancers’ first WCS experience harder than it needs to be? The whole experience would prove more inviting and comforting if students had more time allotted to their own stimulation management. As a physical movement diagnostician, it was fascinating to watch the other participants’ versions of the movement I had just learned. While all the participants had different body types and coordination errors, they all shared a common underlying challenge: lack of core strength. This is a well-documented fitness concern for athletes and non-athletes that can lead to injury and chronic pain. Dancers have heard this advice ad nauseum: “Engage your core! Build core strength!”, so much that we get numb to the meaning of the words. 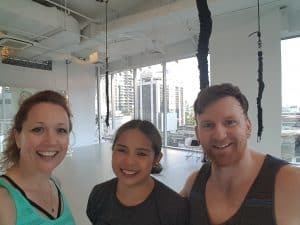 But in this class, the evidence was immediate and obvious: if you failed to engage your core in the “flying push-up” move, you would break at the hips and pike in mid air, and the bungee would yank you back ungracefully. The error was so clear and unbiased: no judging, no opinion, no style preference. It wasn’t just that the move was better with proper technique; it completely failed without it. It was black and white. It was refreshing, actually, for the teacher to be able to prove to the student the consequence of incorrect technique immediately and indubitably. Language and opinions are clearly not obstacles when given physical proof. Got any suggestions for our next mind-blowing, paradigm-shifting experience? Sounds an amazing experience, and really well analysed. 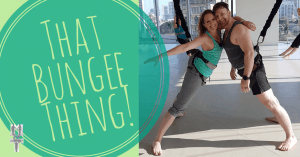 I recently tried aerial yoga, also a challenge in trusting to the equipment!